The Dead Sea Spa Magik Mineral Shampoo gently cleanses hair to eliminate impurities, whilst soothing irritated, dry and flaky scalps. Utilising mud, salt and mineral extracts from the Dead Sea, the caring shampoo works to revitalise damaged hair and rebalance the scalp; helping to banish dandruff and restore long-lasting comfort. Expect a deeply moisturised scalp and soft, smooth hair with added bounce. 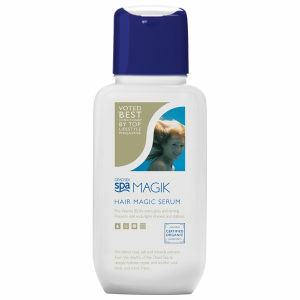 Apply to wet hair, massaging into scalp and hair. Rinse well. Harmonised Water(™)* (Aqua, Maris Sal), Sodium Coceth Sulfate(1), Cocamidopropyl Betaine(1), Sodium Beeswax(2), Zinc Pyrithione, Lauryl Pyrrlidone, Sodium Chloride, Salicylic Acid, Xanthan Gum, Parfum (Fragrance)**, Chamomilla Recutita (Matricaria) Flower Extract***, Tilia Vulgaris (Linden Blossom) Flower Extract***, Melissa Officinalis (Lemon Balm) Leaf Extract***, Aspalathus Linearis (Rooibos) Leaf Extract***.